Our friends brought a chocolate-cardamom cake with orange whipped cream for dessert. I'd have to ask N. She's been pickling all sorts of herbs--we've got pickled dill too. 1. Chop cilantro very, very fine. 2. Massage a little bit of salt into the cilantro. 3. Put in canning jar and cover with just enough water to submerge it. 4. Weight the jar down but leave the lid on loosely. Put into a bowl because it'll spew liquid as it ferments. 5. Once liquid stops coming out, put the lid on tightly and put into the fridge. I've edited the last step, because it should be when liquid stops coming out. Leftover BLT with avocado from the day before. And for breakfast this morning, in honor of AB, though I don't really know what this reveals about my character, I made one. Actually, I made two; the other one was Significant Eater's, and it was what could be called more of a "country omelet" per Jacques, how she likes her eggs cooked. This one's for me - a classic French. 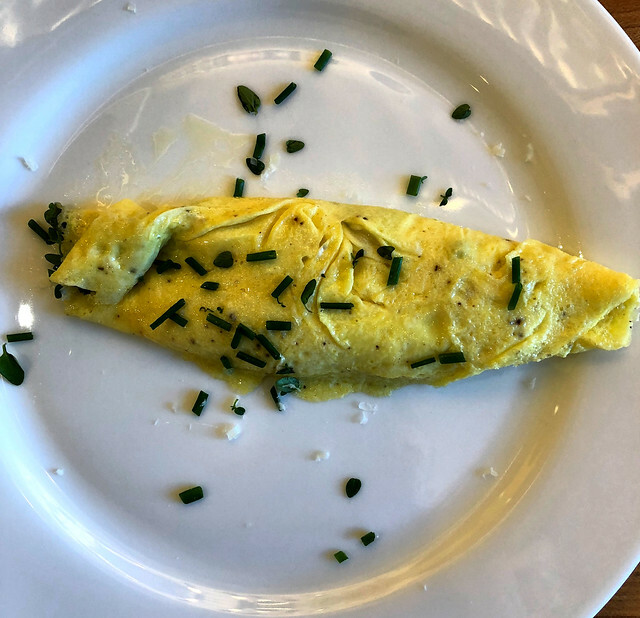 The almost perfect one-egg omelet (Jacques would use 3 (so would sneak, I'm sure)). Fresh herbs from a neighbor's balcony garden, including chives, tarragon and thyme, and a bissel of cheese - Cracker Barrel sharp! I also love this with goat cheese. I've always considered an omelet to be overcooked eggs, but that one is a thing of beauty, and I strongly suspect I would really enjoy it. Omelettes are ever so much more than overcooked eggs. And they really DO reveal things about your inner self. I was so positive Id prefer Jacquess country omelette. But in the event its classic French all the way. I don't know what to call it. Potatoes, a little cheese, eggs. So it's not a tortilla, per se, and it's not a frittata, per se. Notice this thread was started by Omni in 2004. Is she still around?